David DeVaney of Charter Real Estate Corp. about putting office space in part of the Hamilton Place Sears. In a first for its national mall portfolio, CBL Properties plans to put a large chunk of office space into one of its centers as it redevelops the Hamilton Place Sears in Chattanooga. 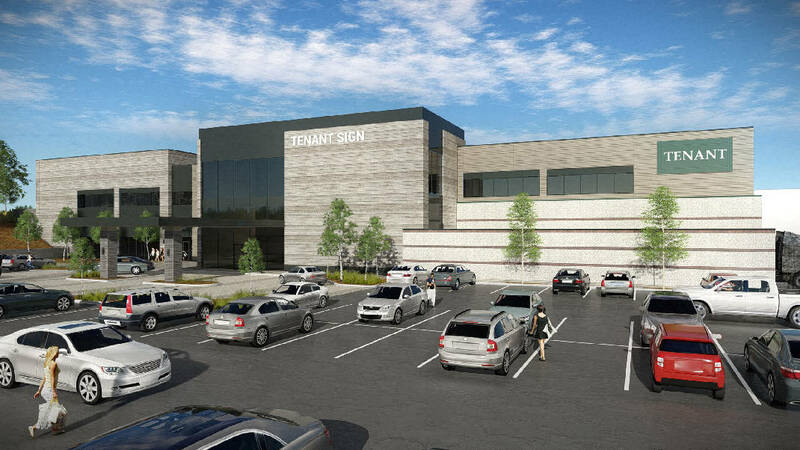 The mall developer wants to lease more than 62,000 square feet of planned office space in the Sears as Chattanooga-based CBL remakes the 150,000-square-foot store and its nearby parking lots into more of a town center. CBL has hired Chattanooga commercial real estate company Charter Real Estate Corp. to find tenants for the new office space. "They have a certain level of experience," said CBL spokeswoman Stacey Keating. "They'll cast a wide net." David DeVaney, Charter's president, said Sears plans to move out in the first quarter of next year and CBL plans to do a "pretty substantial renovation." Already, a Dave & Buster's restaurant and entertainment complex is set for part of the Sears space. Medical offices are another potential reuse, DeVaney said. "It's kind of a unique change in the property," he said about the Sears site. "It makes it more lifestyle and events." The first floor is slated to hold 24,503 square feet of offices, while the second level is pegged for 37,908 square feet, DeVaney said. According to Charter, the space is offered at between $20 and $28 per square foot. Keating said that while CBL has five standalone office buildings in its collection of real estate, there's no such space currently in its malls. "This is a new thing for us," Keating said. "The trend in the industry is to move toward mixed use-type property." CBL already is moving ahead with redeveloping the Sears and its lots. Today, Cheesecake Factory opens its first Chattanooga restaurant in a new building in the Sears lot. Also, a hotel, more eateries, specialty tenants and a nationally known junior anchor store will go on the store site and adjoining lots in a multimillion-dollar revamp, according to CBL. DeVaney said that with the cost of new construction rising dramatically over the last couple of years, the real estate community is rethinking about how it uses space. "It's expensive," he said, adding that the rents generated are hard to match with the owner expectations. DeVaney said that while a revamp of space is difficult in an urban area, it easier in a suburban environment with free and ample parking such as at the mall. "This is a unique opportunity to blend in existing property and repurpose it," he said. "You already have a shell building with infrastructure." CBL bought the Sears store in early 2017 as the iconic retailer has struggled to stay relevant to shoppers. There's often more value to CBL in redeveloping Sears stores than in keeping the retailer. Stephen Lebovitz, CBL's chief executive officer, said he expects the Cheesecake Factory will garner almost as much in sales by itself as the Sears store. CBL also is remaking the Northgate Mall Sears auto center site, which it purchased in 2017, to hold two new restaurants — Aubrey's and Panda Express. Sears is also closing its Northgate store early next year after about 45 years. The retailer still owns that store, and its future reuse is unclear.